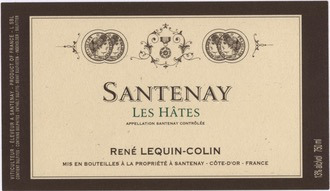 Wine Rene Lequin-Colin Santenay Les Hates 2014 - Royal Wine Merchants - Happy to Offer! Of the two Santenay chardonnays, this is the more generous, and it’s all based in the soil. “Les Hates” is a lieu dit in the mid-slope of the Côte, sandwiched between the Premier Cru sites of Beaurepaire (which is just beneath “Sous la Roche”) and the more famous 1er Cru Santenay sites of Passetemps, Beauregard, Clos des Mouches and Clos Faubard. Here, there is more topsoil which creats a richer, longer wine. But being in the middle of the slope also lends a substructure of thinner, chalkier layers than “Sous la Roche,” adding mineral structure to the fruitiness. The Family Lequin have been "Vignerons" in Santenay since 1679. René LEQUIN and his wife Josette Colin have managed the Domain since 1976. In 1996, François joined his father in order to manage the 9 hectares of vineyards. In 2009, the Domain started organic management and since 2010, biodynamic management. Our philosophy for winemaking is to utilize contemporary methods while retaining respect for tradition. The grapes are hand picked and brought to the winery. There they are pressed in a pneumatically to avoid the extractions of hard or green tannins. The juice is then put straight into oak barrels. We use between 25-30% new oak to maintain varietal character. The grapes ferment in open top vats for 10-12 days. They are punched down and pumped over daily to extract the maximum color, tannins and aromas. After the pressing, the wines are matured in oak barrels for 14-18 months.